Globally, 663 million people do not have access to clean drinking water. As a result 1,000 children die each day from preventable diarrhoeal diseases. Water purification is currently undertaken using a number of different pore filtration and membrane chemistry processes, but these can be quite energy expensive and infrastructure heavy. For example, desalination uses reverse osmosis technology, which consumes a vast amount of energy and requires a large and complex processing plant. In developing countries a number of small-scale water purification methods are in use that rely on ceramic water filters, solar disinfection and other hybrid filters. Some of these methods are successful in removing bacteria and protozoa and some methods are useful in removing heavy metals or organic pollutants. However, in order to prevent more deaths and reliably provide clean drinking water, we urgently need a more efficient and economical water purification process that can be used in remote areas. Nanotechnology offers this promise. Our research is currently focused on developing nanofilters that can remove bacteria, organic pollutants and, potentially, viruses from water. We are employing the special characteristics of carbon nanotubes (CNTs) in this endeavour. CNTs are nano-sized tubes made up of a sheet of carbon atoms that can have diameters down to 100,000 times smaller than a human hair. These nanoparticles are excellent at capturing pollutants, and as a result, CNTs could revolutionise water purification processes. Since the Middle Ages, carbon (charcoal) has been used for filtering water. CNTs are made up of the same atoms, but have a much larger surface area and are therefore even more efficient at capturing pollutants. This includes adsorbing chemical contaminants such as aromatic molecules like benzene and heavy metals. While it is now relatively easy and cheap to manufacture CNTs, they are typically sold in a spaghetti-like tangle that results in poor control over the pore structure and thus water flow. The challenge we are addressing here is the development of manufacturing techniques with better control over the assembly of CNTs to create organised structures of nanotubes with controlled pore size. A longstanding challenge in nanotechnology is controlling the arrangement of CNTs. Dr De Volder’s team has perfected a technique for growing a wonderful diversity of carbon nanotube structures. The starting point is a well know synthesis method using ethylene, hydrogen and helium feedstock gases, which are heated up to 700-800 degrees Celsius, and then interact with ‘nano-seeds’ (iron nano-particles) from which the nanotubes grow – like a plant growing from a seed. The team has perfected this process to organise nanotubes in an amazing array of different architectures. 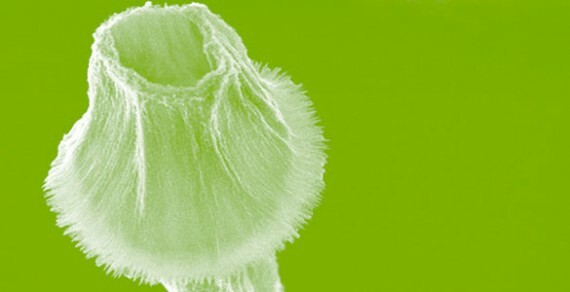 Some of the nanotube structures created actually look like exotic plants and flowers. The structures each contain more than one million organised carbon nanotubes. Interestingly, other environmental applications of CNTs such as in energy storage devices also require fine control over nanoparticle organisation and pore structure. The IfM NanoManufacturing group has been exploring how nanotubes can be mixed with other nanoparticles to improve the performance of lithium-ion batteries. This research has found that CNTs are excellent conductive additives for batteries and that controlling the arrangement of CNTs imparts new functionalities such as foldable electrodes. CNT additives could be used in electric and hybrid vehicles in the future with some early reports estimating that they could potentially reduce both battery production costs and battery weight. While we are designing different nanotube structures to deliver the most efficient systems for water filtration or energy storage, we are also looking at how to scale-up production. To deliver water filters and batteries at a high volume and low cost we need to be able to manufacture them in bulk using a manufacturing platform that is compatible with industrial standards. The most common process for manufacturing battery electrodes and most water filters is roll-to-roll processing. Roll-to-roll processing is a continuous manufacturing method that allows for large area production of materials. In late 2016 we took delivery of a continuous roll-to-roll processing machine, which is now being used to perfect our manufacturing of CNT batteries and filters. Our work is demonstrating that nanotechnology has the potential to contribute to game-changing innovations in the future.